Tell your love ones and friends about our IRS tax relief programs, and we’ll reward you for it! At Fidelity Tax Relief, we pride ourselves in providing a positive experience while reducing your IRS tax debt. We also appreciate when our customers refer our services to others, which is why we have implemented a Refer a Friend Program. Therefore, if you’re happy with you experience with us, we want you to spread the word! If a friend you referred becomes a new customer, we will give them a discount of $50 on our service fees. We will give you a free $50 Gas Card. Fidelity Tax Relief will repeat the reward for each friend you refer to us who engages us for IRS tax debt relief. There is no limit to the number of new customers you can refer and the number of gas cards you can redeem. 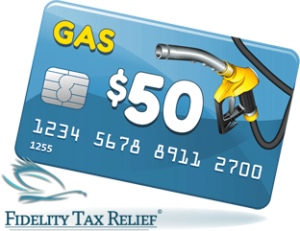 Note: The $50 Gas Card will be sent once the friend has signed up for our services and paid our initial fee.